More on war, police and the ‘security forces’ (see also here, here and here). My copy of Mark Neocleous‘s War power, Police power (Edinburgh, 2014) has just arrived, and I’m about to work my way through it (you can download the Introduction here). 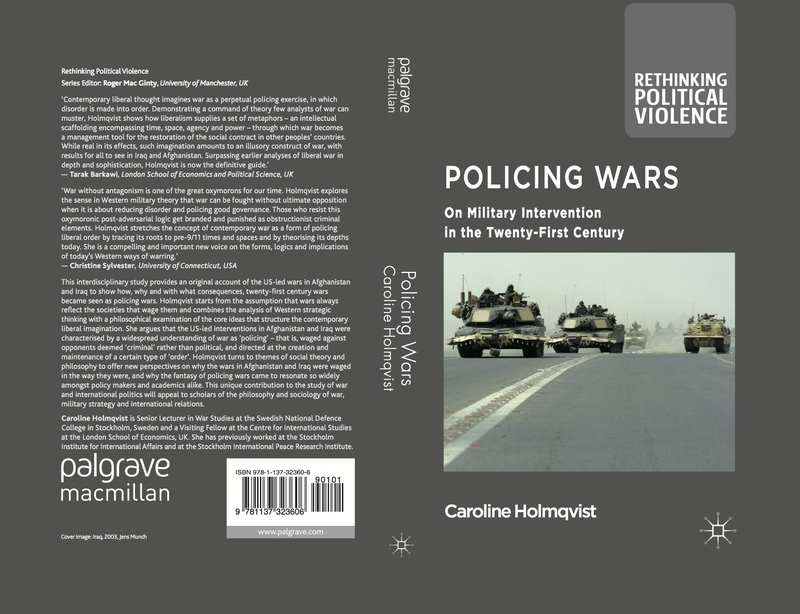 But I’ve just stumbled upon another new book, by Caroline Holmqvist – Policing Wars: On military intervention in the twenty-first century (Palgrave Macmillan, 2014) – that I obviously need to read in parallel. This interdisciplinary study provides an original account of the US-led wars in Afghanistan and Iraq to show how, why and with what consequences, twenty-first century wars became seen as policing wars. Holmqvist starts from the assumption that wars always reflect the societies that wage them and combines the analysis of western strategic thinking with a philosophical examination of the core ideas that structure the contemporary liberal imagination. She argues that the US-led interventions in Afghanistan and Iraq were characterised by a widespread understanding of war as ‘policing’ – that is, waged against opponents deemed ‘criminal’ rather than political, and directed at the creation and maintenance of a certain type of ‘order’. Holmqvist turns to themes of social theory and philosophy to offer new perspectives on why the wars in Afghanistan and Iraq were waged in the way they were, and why the fantasy of policing wars came to resonate so widely amongst policy makers and academics alike. This entry was posted in Afghanistan, books, Iraq, late modern war, police and tagged Caroline Holmqvist, Mark Neocleous, police power, policing, war power by Derek Gregory. Bookmark the permalink.